Satellite Internet forum › TooWay and KA-SAT satellite › Thermal cover necessary ? I am living in the Appenine mountains (Italy) at about 750m and I am considering changing towards Tooway. 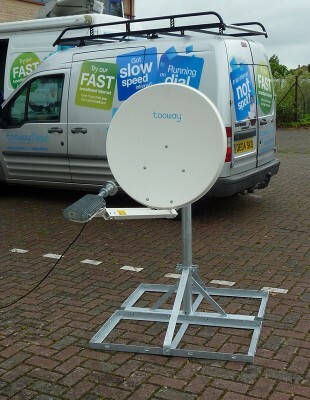 I have read with interest about the speed problems but it seems to me these were only in the UK in certain areas? In our options, we can order some sort of thermal cover against ice and snow. Do you think it is necessary, knowing we do get some heavy snowfall here in winter? Does anyone have experience with it, what can I expect? Would it be possible to place the disk on the ground so we can remove any snow if necessary? Just clean the dish and lnb. I am in the Spain south, and I don�t have speed problems. My internet is always very fast, and I use the system very high. The speed problems are punctual. About the cover, If you can go outside and clean the antenna when the signal is low, Its will solve your problem. In Alaska, at the airports in remote area, the people use the same liquid in the antennas used in the airplane for avoiding the ice. you can buy a little bit and test it. Use a spray for applying. Just got the installer coming round and he says not to put the stuff on the roof but somewhere handy so we can clean off the snow in winter. Indeed, Tooway continues to work even when covered with snow, although probably with reduced speed. If you get a lot of snow it's certainly a good idea to install the dish where it will be reasonably accessible, but perhaps not on the ground or on a terrace, because of vulnerability to being knocked out of adjustment. Where a ground mounting is inevitable, I usually tell people to place some shallow jardini�res round the dish, to stop people, especially children, from getting too close.. Obviously, the flowers musn't be allowed to grow up so as to interfere with the operation of the dish.